The Twittersphere was just a little bit quieter this morning after Marc Andreessen, father of the Tweetstorm, vacated the platform last night. While there’s no clear answer from him or others as to why he decided to take a break, Andreessen is not the first popular Silicon Valley figure to abruptly leave the service. Unlike Altman, Andreessen didn’t leave a Tweetstorm explaining his exit, but it is possible that many of the same reasons could have temporarily driven him off the platform. 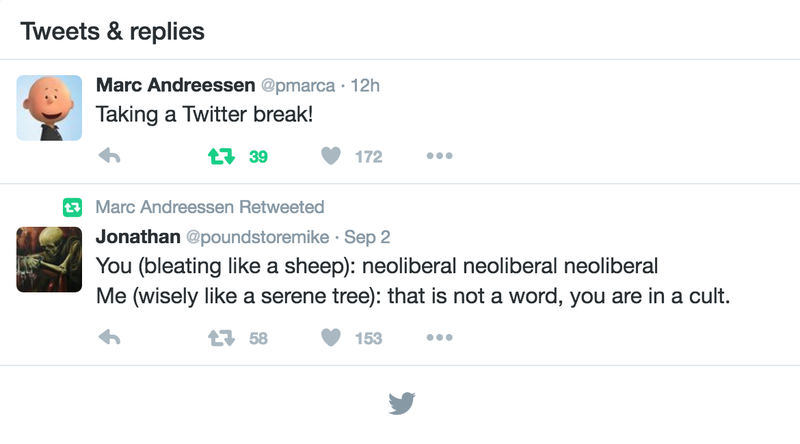 Right now the only Tweets visible on his profile are a four word post about taking a break and a retweet about neoliberalism but when Andreessen was Tweeting on all four burners, he regularly contributed to contentious political debates with other users. Of course, even Altman couldn’t resist the urge to come back to Twitter after a brief absence. Given Andreessen described his actions as a “break,” it will likely end much in the same way with an eventual return. Twitter as a platform has increasingly come under fire for its dismissive approach to the toxic culture permitting from some of the site’s insensitive and trolling users, though Andreessen isn’t usually one to back away from divisive conversations. You could also speculate that Andreessen wanted some of his old tweeted viewpoints to disappear, but at this point it’s highly unlikely. If there was something buried in his feed that he was afraid of, he wouldn’t be able to remove it from the internet just by wiping his account — though removing it from his personal profile would certainly make it less likely to surface. The internet is full of bots that are set up to retweet every single one of his tweets. Even software couldn’t eat all of Marc Andreessen’s Tweets out there in the world. These same bots could also provide an explanation for why Andreessen deleted all of his posts but a single odd retweet. From looking at the bots, it doesn’t appear the retweet was posted anytime close to last nights events. The original creator of the Tweet noted much the same and that the cause could have been bug relating to a previously deactivated profile. The existence of Andreessen bots also means that this poor fellow can continue his PhD thesis. When we reached out to his firm about why Andreessen deleted the tweets, they replied that it was “just a break from Twitter”.